The Humanities Department hosts a lecture on contemporary Arab-American drama and performance. 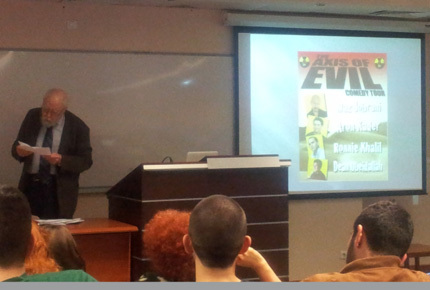 Dr. Marvin Carlson, from CUNY gave a talk on contemporary Arab-American drama and performance. On February 17 LAU’s Humanities Department welcomed internationally renowned Distinguished Professor in Drama and Theater, Dr. Marvin Carlson, from City University of New York to give a talk on contemporary Arab-American drama and performance. “Since 9/11 there has been tremendous growth of Arab-American theater in the United States, providing an important new ethic expression,” reveals Carlson. This development has been especially potent in New York, which has a tradition of supporting multicultural art. This was the second time that Carlson had visited LAU and his relationship with the university stems from his partnership with Dr. Nada Saab, assistant professor of literature. Carlson served as one of the co-editors of Syrian play write Sa’adallah Wannous’s Rituals while Saab served as one of the translators. Carlson’s lecture provided an overview of this body of work and focused on particular examples, such as Lebanese-American Leila Buck and Kathryn Haddad, Palestinian-American Betty Shamieh, Iraqi-American Heather Raffo, and Egyptian-American Yussef El Guindi, as well as the contemporary tradition of Arab-American stand-up comedy. According to Carlson, significant immigration to the United States from the Arab world began in the 1880s. “Most of the early examples of such theater were performed in Arabic and most sought to connect the community to its roots in the homeland by presenting plays about Arab history and culture,” he explains. Years later, Arab Americans portrayed farces about living in the new country, using comedy as a way to explore the cultural challenges they faced as immigrants. After 9/11 everything changed, according to Carlson, especially with the onset of widespread cultural misunderstandings and in some quarters, outright antagonism. “Arab American artists started to form groups and networks. In part to provide support for each other at this difficult period and also to counter the biased representations of their culture in the mainstream media,” he points out. Though covering a variety of genres and diverse works, they all have a similar thread in that they explore the tensions and formations of identity of the Diaspora community. “Such works are of particular importance and urgency at a time when non-American cultures to which they are intimately connected are the subject of widespread suspicion and misunderstanding,” says Carlson. “We are very lucky to have Dr. Carlson with us,” says Saab. “Events such as these raise LAU’s visibility on the international scene—particularly for students enrolled in our well-known communication arts program, this is a wonderful opportunity. Indeed it serves as a great opportunity for students outside the university as well. “This was an amazing chance to be able to get such a rich and intimate view of the state of Arab-American theater and comedy”, says Rami Nazha, an AUB alumna who attended the lecture. Dr. Carlson is the Sidney E. Cohn Distinguished Professor Of Theatre, Comparative Literature and Middle Eastern Studies. His research and teaching interests include dramatic theory and Western European theatre history and dramatic literature, especially of the 18th, 19th, and 20th centuries. He has been awarded the ATHE Career Achievement Award, the George Jean Nathan Prize, the Bernard Hewitt prize, the George Achievement Award, the George Jean Nathan Prize, the Bernard Hewitt prize, the George Freedley Award, and a Guggenheim Fellowship. He has been a Walker-Ames Professor at the University of Washington, a Fellow of the Institute for Advanced Studies at Indiana University, a Visiting Professor at the Freie Universitat of Berlin, and a Fellow of the American Theatre. In 2005 the University of Athens awarded him an honorary doctorate. His best-known book, “Theories of the Theatre” (Cornell University Press, 1993) has been translated into seven languages.